Enough 14th-century English malice and murder to keep several intrepid investigators hard at work. While Sir Baldwin de Furnishill, Keeper of the King’s Peace, is being pressed by the Bishop of Exeter to take a place in Parliament, his friend, Bailiff Simon Puttock, reluctantly escorts Brother Busse from Tavistock Abbey to Exeter to consult Langatre, a local fortuneteller. Upon their arrival, they become embroiled in several murder investigations carried out by their old friend Coroner Sir Richard de Welles, a man who loves strong drink. 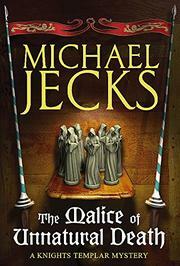 The Bishop is desperate to recover a note carried by one of the victims, a royal messenger. The King and his Despenser allies had recently uncovered a plan by their enemies to hire John of Nottingham, a necromancer, to kill them all. Although the plot is foiled, John escapes and may be plying his exotic trade in Exeter. To add to the confusion, there’s a former messenger with a grudge against the dead man, a retired assassin who once worked for the king, a sheriff whose beautiful wife is almost killed by an obsessed servant girl and a gaggle of other strange denizens of the city. Knowing that the slightest mistake can lead to death, the three investigators struggle to uncover the truth. In Jecks’s latest panorama of medieval life (The Death Ship of Dartmouth, 2006, etc. ), the mystery is once again overwhelmed by exhaustively researched historical detail.